In small saucepan, combine juice, butter and sugar. Heat until butter melts and ingredients are blended. Cool the mixture until it is lukewarm. Add yeast to mixture in saucepan and stir until dissolved. In large bowl, combine flour, eggs and salt. Add to juice-yeast mixture. Mix well. Turn dough onto lightly floured surface and knead until dough is smooth and elastic. Place dough in greased bowl, cover with a cloth and let rise in a warm place for 1 to 1 1/2 hours. Punch down. On lightly floured surface, roll dough to 1/2-inch thickness and cut doughnuts using a 2-inch cutter. Place doughnuts on waxed paper about 1 inch apart and let rise for another 30 to 45 minutes. Preheat oil in Presto® electric deep fryer. If using an adjustable thermostat deep fryer, set at 375°. Fry in hot oil, a few at a time, until golden. Drain well on paper towels. Combine 1 cup sugar and 1 tablespoon cinnamon in a plastic bag and shake well. Then add fried doughnuts, a few at a time, and shake until each is coated with the mixture. 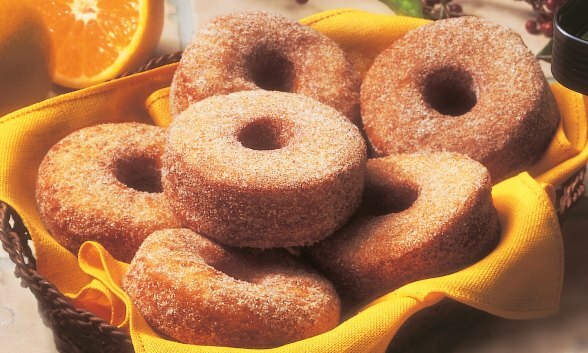 Variation: Make doughnuts as 2-inch rounds (no hole). Fry as directed above. When cooled, make a small hole in the side of each doughnut. Using a pastry bag with tip, gently squeeze the bag to fill each doughnut with strawberry, blueberry, or raspberry jam. Dust with powdered sugar.